Home / Branding, How-To / How to configure and apply custom theme using Crow Canyon Branding? How to configure and apply custom theme using Crow Canyon Branding? This article describes about how to configure custom themes and apply the same for the sites. By default Crow Canyon provides five different themes listed below. To get started with custom branding, we can start with any of the CSS file above except #1 and #2. Mustard and Black themes are not supported for customization. To configure custom theme, first apply the branding for the site with any of the customization supported default Crow Canyon themes with default quick launch type. 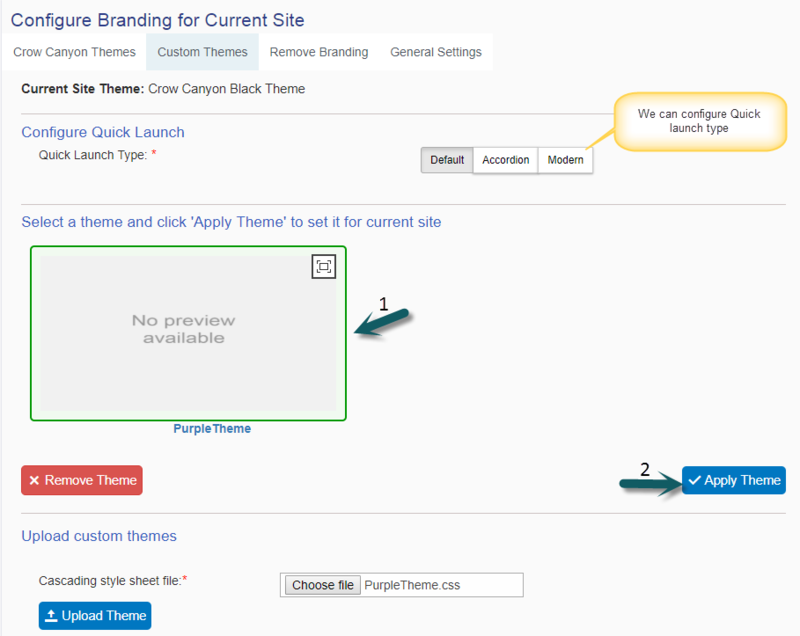 Go to the Site –> Site Settings –> Crow Canyon Branding –> Select the theme (ex: Blue Theme) and select the type of quick launch as “Default” and click apply. It will create a CSS file at Site Contents –> Site Assets –> CCS –> Branding. Download the created CSS file in the above step from the below location. Go to Site Contents –> Site Assets –> CCS –>Branding –> Download the “BlueTheme.css” file and make changes to the css as needed and save the file with a different name. Now apply custom theme on the site by selecting this custom theme along with a quick launch style. For more details, please refer Branding App at https://www.crowcanyon.info/nitro/appmanual_v2/.